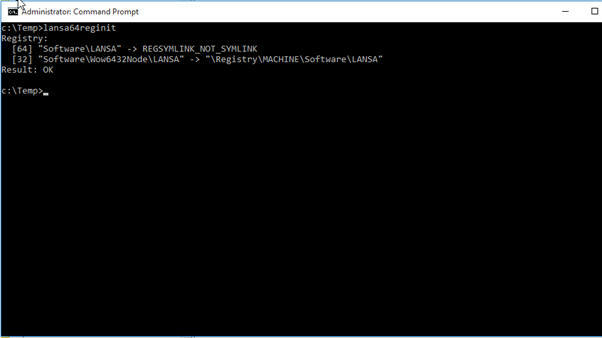 Upgrading to Windows 10 or applying updates to Windows 10 64-bit have the potential to remove the LANSA registry symlink, which can cause problems with launching Visual LANSA. The registry symlink is used to keep the 64-bit and 32-bit LANSA registries in sync. Without these registries being in sync, the Visual LANSA development environment will fail to launch with a global initialisation failure. There is a registry tool available that can be used to restore the symlink. Please contact your local LANSA support team and ask for the lansa64reginit utility. Once you have received the utility, save it onto your local PC and run it from the command line as administrator. Once it completes successfully, you will be able to launch the Visual LANSA development environment.